Earlier this week, MGM, Orion Pictures and Bloom made the announcement fans have been waiting decades for, that Bill & Ted 3, now titled Bill & Ted Face the Music, is finally happening, with international sales starting this week at the Cannes Film Festival. Today we have new details on this long-awaited sequel from writer Ed Solomon, who wrote 1989's Bill & Ted's Excellent Adventure and the 1991 follow-up Bill & Ted's Bogus Journey, alongside Chris Matheson. While the announcement featured an official plot synopsis, Ed Solomon offered his own synopsis that includes new details including Bill and Ted's daughters, and more. Here's what he had to say, when asked about the sequel's story. "Bill and Ted were told at 16 that they were going to be the greatest people who ever lived. That they were gonna write a song that is going to save the world, and it hasn't happened. And now they are middle-aged men. They've got wives who used to be princesses in medieval England who are now working double shifts at Denny's, they've got teenagers that are about to leave home, money is tight, and they've been chasing this dream, writing song after song, when somebody from the future shows up and says, "You have 24 hours. The fate of all of space/time depends on it, and if it doesn't happen now, it's never gonna happen." Bill and Ted are confused because they know they had to have written it, because after all the people in the future told them they did...So they just must not have written it yet. So in their desperation they decide their only option is to go into the future, to when the have written it, and to steal it from themselves. What follows is a kind of utterly absurd, Christmas Carol-like journey through their lives past, present, and future. Their daughters (Bill has a daughter named Thea, Ted's daughter is named Billie) are also very involved in trying to help them. It's a total comedy, but I think it's really, really grounded in the sweetness that is Bill and Ted and the emotion of where they would be at this point in their life." 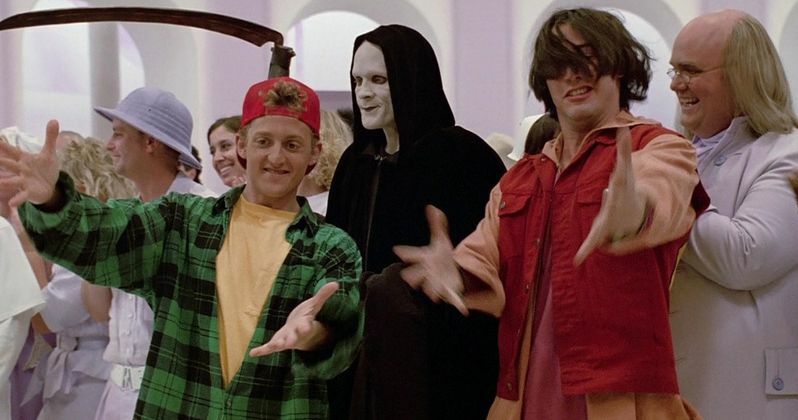 The writer also spoke about the development process for the first sequel, 1991's Bill & Ted's Bogus Journey, and how the executives wanted it to be more of a rehash of the first movie. While they came up with an idea they all eventually agreed on, after Bogus Journey, the writers, along with Keanu Reeves and Alex Winter, agreed to never go back to the franchise until they found a way in they could all truly get behind. The official plot synopsis only briefly mentioned the daughters of Bill and Ted, but Solomon added a few more details about these characters. "They are brilliant and ridiculous and sweet, and we think would be two amazing roles for two young women, up-and-coming comedic talent. There's a lot of room for really interesting cameos in this one as well, from all sorts of people." Solomon also added that while he could see the Bill & Ted franchise continuing with the title characters' daughters, they are focused on this movie first. The writer also revealed that director Dean Parisot is the "perfect" person to take the helm of this sequel, not just because of his resume, which includes classics like Galaxy Quest, but also because he's, "really funny and really absurd, but he also has a really deep heart and a deep soul." You can take a look at Ed Solomon's full interview with more details about Bill & Ted Face the Music over at Collider.